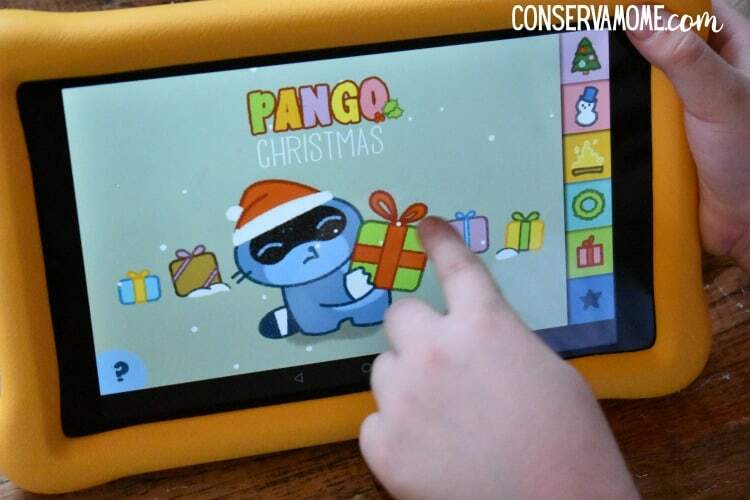 Find out how you can Incorporate Technology and Holiday Traditions with the Amazon HD 8 Kids Edition tablet. This post was sponsored by Amazon as part of an Ambassador Activation for Influence Central and all opinions expressed in my post are my own. Technology is here to stay no matter how you look at it. So that’s why it’s important not only to teach our kids how to properly use it; we also need to help them accomplish valuable learning lessons through technology. Most important during the holidays we need to help bridge the gap between traditions and tech. We’ve begun incorporating tech into our family in many ways, and holiday time is no exception. 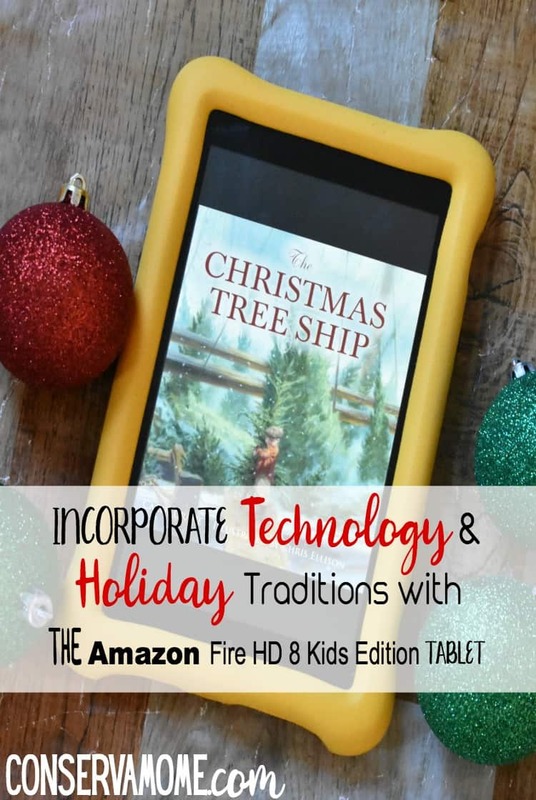 That’s why I’m so excited to have teamed up with Amazon to show you how your kids can get excited about the holidays thanks to the Fire HD 8 Kids Edition Tablet. This tablet is unlike any on the market when it comes to kids tablets (believe me I’ve tried them all). You have the power of Amazon behind a machine that will bring hours of learning and fun for your little one. All through safety and ease. I love how I’m able to let my kids explore books, songs and videos that are age appropriate and fun all while still monitoring the amount they use and what they use. What makes the Amazon Fire HD 8 Kids Edition Tablet so amazing? Read on to find out. The Amazon Fire HD 8 Kids Edition Tablet is the perfect gift for the Holidays. This can even be a fun pre holiday gift, because you’ll find so much holiday content that your kids will love! There is a large variety of holiday titles that are available in Amazon FreeTime Unlimited (also for a variety of holidays). 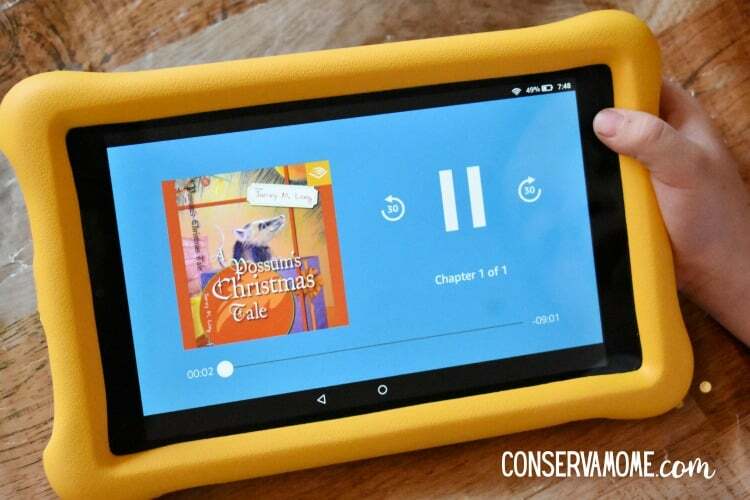 Reading holiday stories just got easier (and funner) you can use the Fire HD 8 Kid Edition and Amazon FreeTime Unlimited to read a holiday book together, or listen to an Audible book. If traveling is part of your holiday traditions, the Fire HD 8 Kid Edition is perfect. With Offline Mode, you can download content before you take off so you never need to worry about finding a Wi-Fi connection to enjoy favorite books, videos, educational apps, Audible books, and games. There are even kid-friendly cookbooks available in Amazon FreeTime Unlimited on the Fire HD 8 Kid Edition.So your little Chefs can mix up some holiday fun! There are a few fun Fire HD Kids Editions to choose from including the Fire 7 Kids Edition, the Fire HD 8 Kids Edition, or the Fire HD 10 Kids Edition. All three tablets come with a kid-safe bumper in blue, pink, or yellow, one year of Amazon FreeTime Unlimited, and two-year worry-free guarantee. The tablets will run you between $99.00-$199.00. They’re all amazing and the prices vary due to storage space and battery life as well as some other features depending on your edition. However, the fun will be big on all of them. One reason that Amazon Fire kids Tablets are stand out from the rest is Amazon FreeTime & FreeTime Unlimited. Each new tablet comes with a one-year subscription to Amazon FreeTime Unlimited. After the first year, Amazon FreeTime Unlimited starts at just $2.99 per month for Prime members and $4.99 per month for customers who are not yet Prime members. And let me tell you it’s worth every penny! What’s Amazon FreeTime & FreeTime Unlimited? 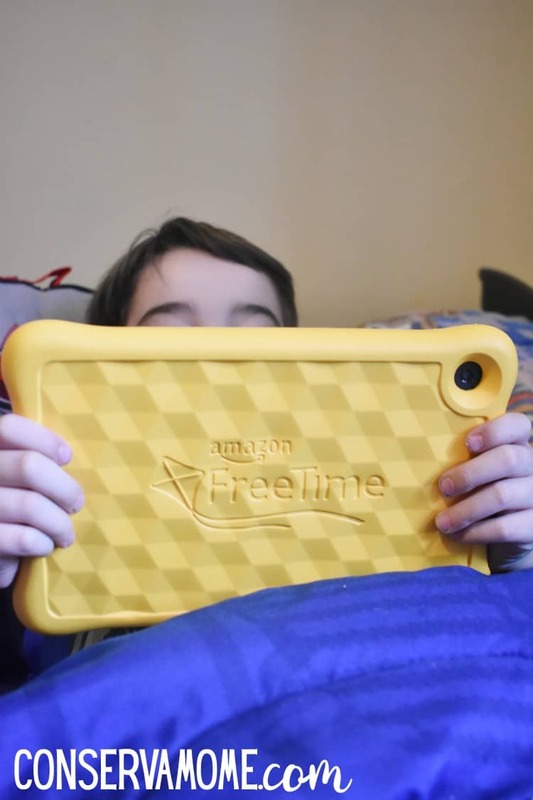 Amazon FreeTime is a free suite of award winning parental controls that encourage learning before play, and give parents the ability to set educational goals and screen time limits by content type, including innovative features like Learn First and Bedtime, plus an optional Kids Browser featuring tens of thousands of kid-safe websites and web videos. Amazon FreeTime Unlimited is an optional all-in-one subscription service that gives kids unlimited access to over 20,000 books, videos, Audible books, educational apps, and games that are age-appropriate and hand-curated by the FreeTime team. But you know what I love the most? The Spanish language content. I’m not going to lie, even though Spanish was my first language teaching it to my kids has been a challenge. Especially when my husband isn’t Hispanic. Finding content that interest them in Spanish is also a challenge. Thanks toAmazon FreeTime and FreeTime Unlimited I know have access to over 1,000 age ,000 age-appropriate books, videos, educational apps, games, and Audible books, plus thousands of kid-friendly and hand-curated websites and web videos—all in Spanish! This is truly something amazing for me because I can help my kids grasp Spanish all while still incorporating themes they will love and will keep their interest. Best of all the Fire HD 8 Kids Edition Tablet and Amazon FreeTime provide peace of mind for parents too. Using the Parental Control settings in FreeTime, parents can set time limits, adjust age filters, enable/disable web browser access, and choose whether to allow in-app purchasing. Parents can also use Parent Dashboard to review the digital content their kids are using in FreeTime, determine how to manage time limits and educational goals, and remotely adjust their child’s FreeTime settings. So keeping track of how and when your kids use technology just got easier. So if you’re looking for the perfect Holiday gift the Fire HD 8 Kids Edition Tablet is perfect for any kid on your list. Most important head to Amazon and grab a fun Fire HD 8 Kids Edition Tablet for that special kid in your life this holiday season! It is so important to have parental controls. I love that there is something in place to help parents. I have always said knowledge is power! And our grandkids/kids have the whole world open to them!! They have to be guided, not scared to death about the perils of this world. This tablet seems to let them have fun and learn. Hopefully too, they remember to have fun and to put the technology down. Everything in moderation. Have them go outside. Get some fresh air. That durable fun tablet will still be there when they go back inside! They can have the best of both worlds! Thank you for sharing! The Fire HD 8 Kids Edition Tablet is a great fit for my grandchildren. And the warranty is a plus. They shouldn’t label this for kids…. it’s also perfect for clumsy adults like me! I neeeeed one of these!!!!! I like that parents can have control over their child’s tablet. Safety is always number one in my book where my grandkids or other children are involved! It’s too bad that there are predators out there waiting to pounce on them! An extra selling point is each new tablet comes with a one-year subscription to Amazon FreeTime Unlimited. This is perfect for kids to have fun and learn. Thank you for sharing all this information so I can make a positive decision when I go to buy one for my granddaughter. These are great and I love that they come with games and tools for the children. That sounds like a fun tradition. We’ve had the Kids Kindle for a few years now. Their 2 year no conditions warranty is so awesome. We have broken a few Kindles and had them replaced completely free! My granddaughter would love this tablet. My grands would love this tablet! Wow the tablet looks amazing for my children and I would have control. I will share with those with children.. Thank you!! Love that companies are more in tune with creating better parental controls! The Amazon FreeTime perks alone sound worth it to check out this tablet. We currently have a family tablet that we all share, but I like the things you mentioned in this post. Could it be time to get my seven year old his own tablet? This is so nice it would be great for my granddaughter. 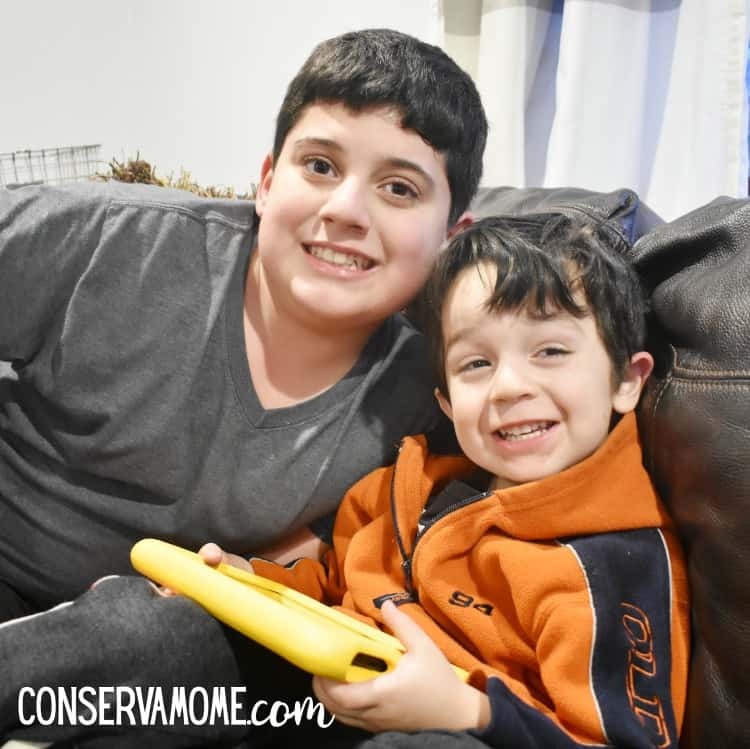 I love my kindle – it’s great that they now have one that can play educational games with my children to keep them happy on long drives or a rainy afternoon. Parent Dashboard to review the digital content their kids are using in FreeTime is a very important feature to this durable tablet. I think it is extremely smart to have parental controls on all of your kids electronics. Great looking product. It’s neat that you can learn Spanish on it. Nice tablet with parental control I like that. A big part of our lives.. technology that is 🙂 Lots of options. Great tablet for children. Love the fact that parents have control over it.